I know I'll never digitize my entire film catalog. But with the The Lomography Smartphone Film Scanner, I can choose images from my catalog, scan them with my iPhone, and use them immediately on Flickr, Instagram, Twiter, Facebook, and The Digital Story. It's a Kickstarter program that still has openings at the $50 level and above. Delivery is scheduled for March 2013. 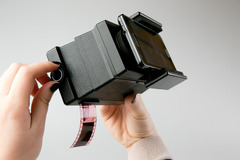 It's a clever idea that not only allows us to use our old slides and negatives, but encourages photographers to fire up their film cameras and burn a roll or two. I'll report more when I have the scanner in hand.